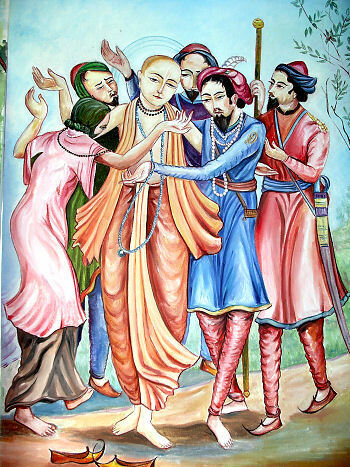 Lord Chaitanya Mahaprabhu appeared in the late fifteenth century, 1486. He took birth in Bengal, India, which at the time was being governed by the Pathana Muslims. At the age of seventeen Chaitanya Mahaprabhu started his sankirtana movement (the congregational chanting of God's names). He preached to all the citizens of Navadvipa to chant the Hare Krishna mantra (hymn), and in each and every home they began performing sankirtana regularly. When the sankirtana movement thus started, no one in Navadvipa could hear any other sound except the words "Hari! Hari!" and the beating of the mridangas (drums) and clashing of hand cymbals. Hearing the continuous chanting of the Hare Krishna mantra, the local Muslims became very disturbed and submitted a formal complaint to the Chand Kazi. The Navadvipa city magistrate holds the title of Kazi. The city magistrate at that time was known as Chand Kazi. The landholders levied taxes on the land, but keeping law and order and punishing criminals was the duty entrusted to the Kazi. Both the Kazi and the landholders were under the control of the governor of Bengal, who at that time was known as Suba-bangala. The districts of Madia, Islampura and Bagoyana were all under the landholder named Hari Hoda or his descendant known as Krishnadas Hoda. It is said that Chand Kazi was the spiritual master of Nawab Hussein Shah. According to one opinion Chand Kazi's name was Maulana Sirajuddin, and according to another, his name was Habibar Rahman. Descendants of Chand Kazi are still living in the vicinity of Mayapur. 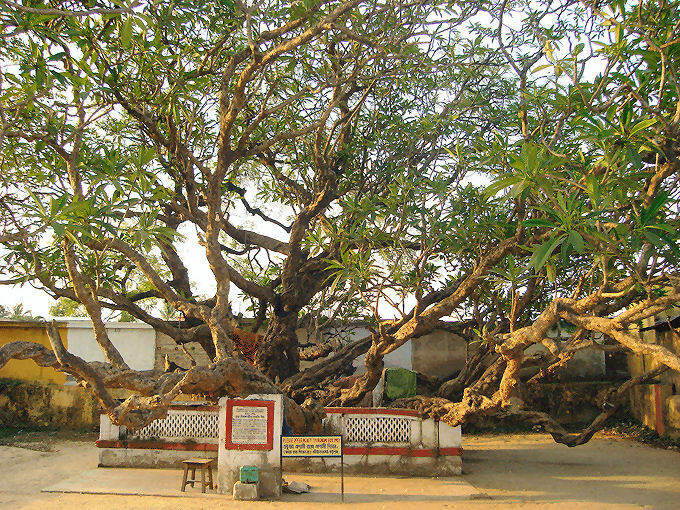 People still go to see the tomb of Chand Kazi, which is underneath a champaka and neem tree and is known as Chand Kazi's Samadhi. Chand Kazi angrily came to Shrivas Pandit's house one evening, and witnessed a joyful kirtana (singing) going on, he broke the mridanga (drum) and spoke as follows: "For so long you all did not follow the regulative principles of the Hindu religion, but now you are following them with great enthusiasm. May I know by whose strength you are doing so?" It appears that from the time of Baktiyar Khiliji in Bengal until the time of Chand Kazi, Hindus, or the followers of the Vedic principles, were greatly suppressed. Practically no one could execute their Hindu religious principles freely. Chand Kazi was referring to this state of Hindu society. Formerly the Hindus were not publicly executing their Hindu principles, but now they were freely chanting the Hare Krishna maha-mantra. Therefore it must have been by the strength of someone else that they were so daring. Actually, that was the fact. Although the members of the so-called Hindu society had followed the social customs and rituals, they had practically forgotten to execute their religious principles strictly. But with the presence of Chaitanya Mahaprabhu they actually began following the regulative principles according to his order. Chand Kazi continued: "No one should perform sankirtana on the streets of the city. Today I am excusing the offense and returning home. The next time I see someone performing such sankirtana, certainly I shall chastise him by not only confiscating all his property but also converting him into a Muslim." After saying this, the Kazi returned home. To convert a Hindu into a Muslim was an easy affair in those days. If a Muslim simply sprinkled water on the body of a Hindu, it was supposed that the Hindu had become a Muslim. Hindu society was so strict at the time of Chaitanya that if a Hindu was converted into a Muslim, there was no chance of him being readmitted into the Hindu religion. In this way the Muslim population in India increased. None of the Muslims came from outside; social customs somehow or other forced Hindus to become Muslims, with no chance of returning to Hindu society. Emperor Auranzeb also inaugurated a tax, which only Hindus had to pay. Thus all the poor Hindus of the lower class voluntarily became Muslims to avoid the fax. In this way the Muslim population in India increased. Chand Kazi threatened to convert the people into Muslims by the simple process of sprinkling water on their bodies. Chand Kazi was a high ranking officer in the kingdom of Emperor Hussein Shah in Bengal. During the time of Mahaprabhu, he was the ruler of Navadwip and the chief magistrate. It has been reported that he used to interpret the Muslim's holy book called the Koran and would direct the emperor in his devotion to the Muslim god Allah. He was a staunch and obstinate oppressor of the Hindu religion in every way, and he was especially opposed to Hari Nama Sankirtan. In Krishna Lila he was Kamsa, and Hussein Shah was Jarasandha. One day Chand Kazi was passing by Shrivas Angan when he heard the melodious ringing of karatals and the rhythmic beating of mridangas. The blare of conch shells and the ecstatic singing of Hari Nama Sankirtan filled the atmosphere with joy. The Kazi, hearing the jubilation of the devotees, immediately became envious and tried to call to his mind the Koran's instructions regarding the religious practices of others. But, he was unable to do so. Enraged all the more, he entered Shrivas Angan house and grabbed a mridanga from one devotee and smashed it to the ground. He then ordered his men to beat whomever they caught. Finally, he issued the ultimatum that anyone caught singing the names of Krishna would have his property confiscated and would be forced to convert to Islam. The Kazi was planning to convert Hindus to Islam by sprinkling water on them. The next day the devotees went to the house of Lord Chaitanya and reported all that had occurred. When the Lord heard that Chand Kazi was attempting to stop the sankirtan movement, He became furious. 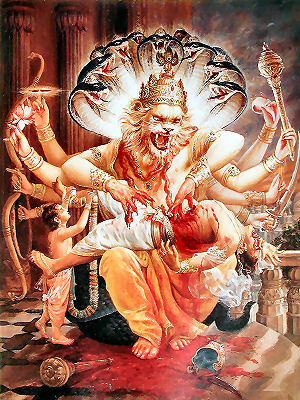 However angry Shiva looks at the end of the cosmic annihilation was mild compared to how angry Lord Chaitanya looked. With a glance that could humble lightning and a voice like thunder, He ordered Nityananda Prabhu to immediately assemble all the Vaishnavas. He ordered each to bring a flaming torch and announced that they would together perform a gigantic nagar sankirtan throughout the city of old Navadwip. Lord Shri Chaitanya Mahaprabhu then sang the Holy Names of Lord Krishna and danced in ecstasy. He thus began preparing for the first public performance of sankirtan. When all the Vaishnavas had asssembled, Lord Chaitanya organized them into groups. Advaita Acarya led one group. Haridas Thakur led another group, and Shrivas Pandit led still another group. Each group was fortified by four mridanga players, sixteen karatala players, one expert leader of kirtana and one ecstatic dancer. Each group was followed by thousands of devotees, all decorated nicely with tilak and each glorified by Tulasi neckbeads. The triumphant blare of conch shells, some deep and some high, filled the air. Lord Shri Krishna Chaitanya Mahaprabhu's sankirtan-lila was never revealed in any previous incarnation. Lord Chaitanya looked as effulgent as a million suns. Fragrant malati flowers decorate His hair, and a beautiful floral garland of five varieties of flowers hung down to His knees. His body shone like molten gold and was smeared with sandal­wood paste. A sweet smile adorned His face. 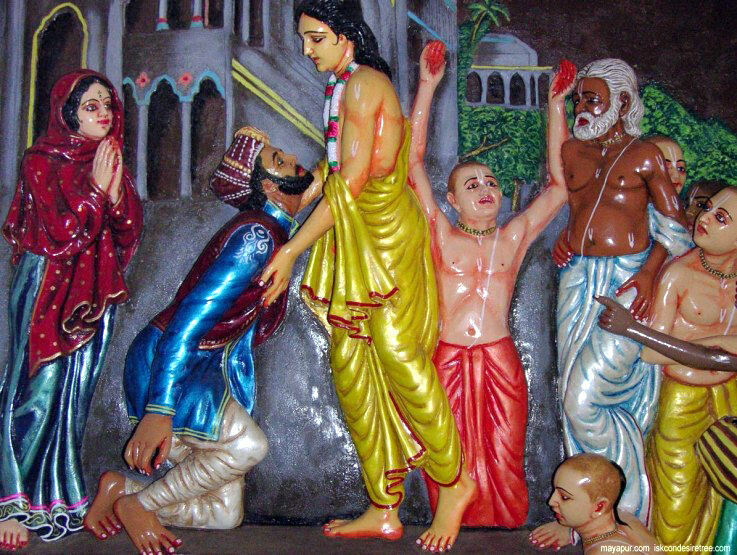 Lord Chaitanya, with Prabhu Nityananda close by His side, began leading hundreds of thousands of people north along the bank of the Ganges river. 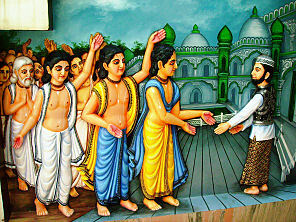 First He went to His own bathing place called Mahaprabhu Ghat and danced ecstatically. After that, He danced to Madhai Ghat, Barakona Ghat, and Nagariya Ghat and then left the bank of the Ganges. Lord Chaitanya then danced through the village of Ganganagar and then on to Simulia where the Chand Kazi resided. This can be read verbatim in the Shri Chaitanya Bhagavata, Madhya Khanda, Chapter 23 (beginning with verse 298) by Shrila Vrindavana das Thakur. When the Kazi heard the tumultuous uproar, he sent his spies to discover the cause of the commotion. When the spies saw the huge nagar sankirtan party which stretched for miles, and when they heard the roaring Hare Krishna kirtan, they immediately fled in terror. They reached the Kazi and advised him to flee. They then reported what they had seen. The Kazi began to shake in fear as the sankirtan party got close. The kirtan became louder and louder. Suddenly, it was outside his door, and above the powerful resounding of Hari Nama, a voice like thunder said, "Where is that mischief monger Chand Kazi who tried to stop My sankirtan movement? I have incarnated to propagate the congregational chanting of the Holy Names of Lord Krishna. I am always present wherever My devotes ecstatically chant My Holy Names! How dare he break the mridanga that accompanies My sankirtan? How dare he obstruct what I have inaugurated to redeem this world? Now break down the doors and bring that rascal to Me without delay. Destroy anyone that stands in your way!" The Lord's words sounded like the roaring of a lion. 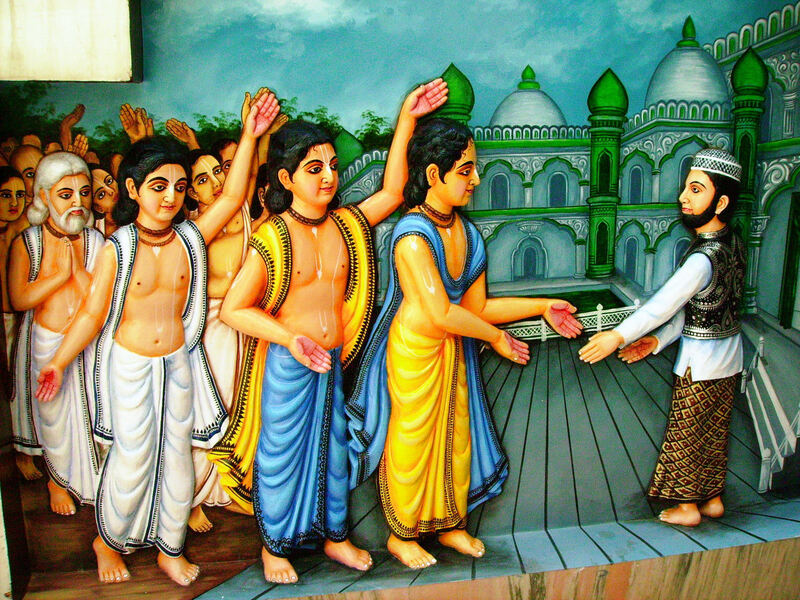 At that time, some venerable and saintly souls fell at Mahaprabhu's feet and requested that He become merciful. They said that the Vedas describe the Supreme Lord as always poised, blissful and free from anger. Even when Brahma stole all His cowherd friends and calves, and even when Indra attacked Vraja with excessive rains, still the Lord remained equipoised. They requested the Lord to not in this way abandon His neutrality and minimize the Vedic injunctions. Lord Chaitanya became pleased, and He sent several respectable members of the brahminical community within the house of Chand Kazi. They found him in a corner, petrified, and shaking in fear. After becoming calm, the Kazi came out before the Lord with his head bowed. As the Chand Kazi was His maternal uncle, Kamsa, in Krishna lila, Lord Chaitanya addressed him as uncle. Lord Chaitanya then asked the Kazi why he killed and ate cows. The cow is the mother of everybody because the cow unselfishly and indiscriminately gives everyone her own milk. How can one justify killing and eating such a mother? There are many mistakes and illusions in non-Vedic scriptures. The compilers of these scriptures, not being exposed to the Absolute Truth, could not realize the essence of spiritual knowledge. They thus wrote things directly against logic and reason. Even the most basic of religious concepts, like the nature of the soul, the transmigration of the soul from body to body, and the eternality of the soul, cannot even be directly understood from these scriptures. In addition, the answers in these scriptures to many questions have changed over the centuries and are contradictory to the conclusions of the past. As the philosophy of these religions changes from time to time, this indicates that the original compilations were not of an eternal nature. Chand Kazi stated that according to the Muslim book, the Koran, there is no mention or any authorization for killing the cow. He concluded that those who say these conclusions are authorized are speaking against the Holy Koran. From that time onwards, Chand Kazi became a devotee and he refrained from meat-eating and the killing of any creature. Even during the chaotic Hindu-Muslim riots, the descendants of Chand Kazi kept intact the promise given by their ancestor and never had any conflict with the Hindus. Lord Chaitanya, changing the subject, asked the Kazi why that night before he had stopped the sankirtan at Shrivas Angan but that today he did not try to stop it. The Kazi, looking grave, told the Lord that after breaking the mridanga he came home and went to bed. That night he dreamed that a ferocious and fearful being with the body of a man and the head of a lion and who possessed frightful teeth and elongated nails threatened him with death if he ever again impeded the sankirtan movement. Sitting on his chest and roaring fearfully, He scratched him. The Kazi then bared his chest, and the devotees saw the unmistakable nail marks of a lion. They immediately remembered Nrsimha-deva and accepted the Kazi's story in great wonderment. The Chand Kazi, with tears in his eyes, then fell at the lotus feet of the Lord and vowed that from that day onwards neither he nor anyone from his dynasty would ever, now or in the future, put any obstruction whatsoever to the sankirtan movement. If, said the Kazi, any descendant of his ever did so, then that descendant would be rejected from the family and disinherited. Hearing this, Lord Chaitanya chanted "Hari! Hari!" Rising, He led the jubilant and victorious sankirtan party back to Shridham Mayapur. As He was returning, He stopped at the house of His dear devotee Shridhara. After Chand Kazi left his body, his samadhi was placed in Navadvipa. This tree towering above his Samadhi is more than 500 years old. This tree actually witnessed all these past events. Devotees of Lord Chaitanya, feeling humility, circumambulate the Chand Kazi's samadhi for he received the Lord's mercy. If you look up at the tree you will see that although it is hollow inside, it still always offers nice flowers. Chand Kazi's Samdhi in Simanta. This stone samadhi with a huge champaka tree entwined around and towering about it is the samadhi of the Muslim ruler Chand Kazi, who was the magistrate of Navadvipa. This place is located just outside the boundary of Shri Antardwip. Nearby was his palace, and in the same general locale the father of Sacimata, Nilambara Cakravarti, resided. When Lord Sri Caitanya Mahaprabhu was in Mayapur, Chand Kazi was the Chief Magistrate of Navadvipa. He was a devout and strict Muslim who was well versed in the Koran. As the Chief Magistrate of Navadwipa-Mayapur, he kept law and order for the Hussein Shah and was also the spiritual advisor of the Shah. He was a tyrannical ruler and the Hindus were oppressed in their religious practices. Angry that devotees were not obeying his order forbidding chanting of the Holy Names: “Hare Krishna Hare Krishna Krishna Krishna Hare Hare / Hare Rama Hare Rama Rama Rama Hare Hare” during the Kirtana, Chand Kazi went with two boats of soldiers to Srivasa Pandita's house to personally enforce his ordinance. He confiscated their instruments and broke mrdanga drum. He then threatened imprisonment and conversion into a Muslim for anyone who disobeyed his order again. The devotees did not protest against the Kazi ban out of fear. They went to the Lord Sri Caitanya Mahaprabhu and reported to Him, “We have stopped our kirtana out of fear for the Kazi, whose men in hundreds search the streets and houses. We will have to leave Navadvipa and settle elsewhere, we have come to tell You this.” When Lord Caitanya heard that someone was trying to stop the Sankirtana movement He became infuriated, He looked awesome, almost like Lord Siva at the time of the cosmic annihilation. He roared loudly like the rumbling of thunder and the devotees afraid of this sudden change in the Lord held their ears as if begging forgiveness from the Lord for a mistake they had not committed. The devotees dispersed right away, each going his way in great anticipation not caring about eating or anything. Excited talks filled every home that, “Nimai Pandita will take out a Sankirtana and dance in the streets of Navadvipa.” For the many thousands who were lamenting for so long that they could not see Nimai Pandita 's dancing this news was cause of great rejoicing. So everyone prepared their own torch. Huge barrels of oil were kept in readiness. Navadvipa in those days was very thickly populated. The constant flow of people with torches poured out of the houses onto the streets. The women, children, and old men were excited with great anticipation. Slowly the clusters of devotees moved towards Nimai Pandita 's house. When Lord Caitanya heard that all the Vaishnavas had assembled at His behest and were at His door steps. He went to meet them and began to organize them in groups. Advaita Acarya was to head up a group and was the chief dancer and he would be supported by a kirtana group. 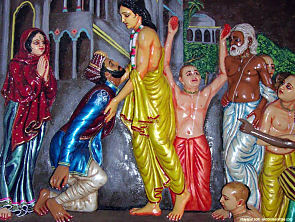 In another group Haridasa was the leader and he also was backed by a kirtanagroup. Yet another group was to be led by Srivasa Pandita. The Lord's eyes fell on Nityananda and immediately He said, “I will not leave Your side My Lord. My only duty is to always be near You. I can never leave Your lotus feet imbedded in My heart. What power do I possess to dance independently away from You. My devotional service to You is I am always with You.” When Lord Caitanya saw the streams of ecstasy flowing from Nityananda's eyes He embraced Him and kept Him near Him. Gadadhara Pandita also stayed along with the Lord. Led by the Supreme Lord Himself, a tumultuous uproar of the holy names: Hare Krishna Hare Krishna Krishna Krishna Hare Hare/Hare Rama Hare Rama Rama Rama Hare Hare burst forth as the massive ocean of people rhythmically surged towards Chand Kazi’s palace in the first ever public kirtana. For the citizens of Navadvipa it was a momentous occasion as it was the first time they were able to see Gauranga’s exquisite dancing and His ecstatic chanting of His own holy names. Overwhelmed with spiritual emotions from seeing Caitanya Mahaprabhu’s supreme bliss, they became captivated by the intoxicating sweetness of the congregational chanting of the holy names. They left their homes and families unattended and spontaneously joined the devotees in the unbounded ecstasy of chanting and dancing in kirtana. The dust from rolling on the ground made Gauranataraja’s body glisten in the rays of light from the unlimited number of torch-lights that lit up the sky. At times He became stunned and stood in the three-fold bending form of Krishna playing His flute, revealing Himself as the Supreme Personality of Godhead. Then, in the mood of a humble devotee, He cried aloud, begging the Lord for devotion to His lotus feet. Lord's charming looks overshadowed the attractiveness of millions of Cupids put together. He glowed like a mountain of gold, His body being smeared with sandal paste sometimes looked like the rising full moon. His curly dark tresses were decorated with the fragrant malati garlands; a sweet smile clung intimately to His lips that can win the hearts of all the muses. The clear markings of sandalwood tilaka with a red dot of vermillion adorned His beautiful broad forehead. He raised His arms up in the sky chanting the name of Hari and danced; the knee long flower garland around His neck swayed with each movement. His upraised arms glistened like fine tapering pillars of gold, His body became drenched with the incessant flow of ecstatic tears from His lotus petal eyes. As His ecstatic feelings increased the hairs of His body stood on end like the ever fresh kadamba flower. The moist reddish lips so exquisite and when parted revealed a symmetrical set of pearl like white teeth; the long arched eyebrows languished almost all the way up to the beginning of His ears. His strong shoulders shamed the king of elephants and His chest was broad and full. Everyone looking at Him commented on His divine and beautiful presence. The millions who milled around for this momentous occasion were very fortunate in spite of their large number they all received the Lord's benedictions by being able to see the Lord's exquisite transcendental face. 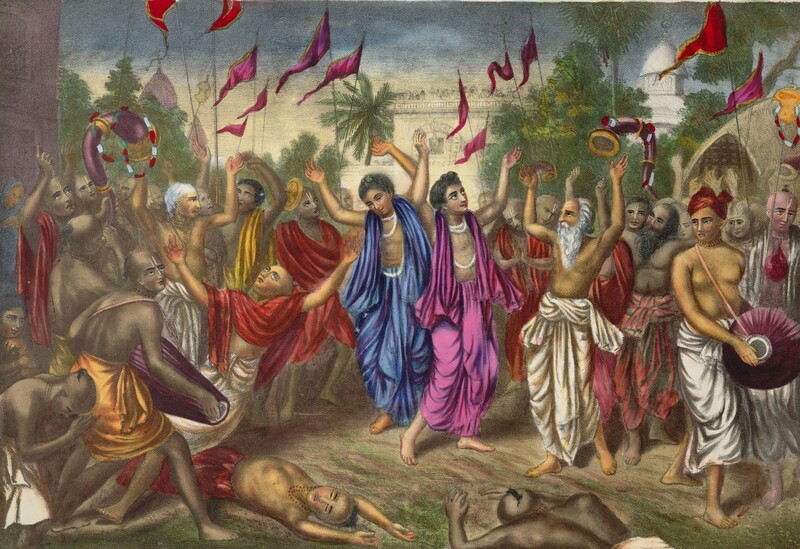 The devotees became inebriated and danced liked madmen. Their first experience of public congregational chanting transported them to unknown heights of spiritual intoxication. Thus Lord Caitanya, opening the flood-gates of His own Krishna-prema, drowned everyone in that ocean and, in doing so, personally inaugurated His Harinama-Sankirtana movement – the only means of deliverance in the age of Kali. The Harinama procession went along the bank of Ganga to Madhai Ghata, Barakrona Ghata and then to Nagariya Ghata. The chanting of this kirtana was so loud, the Kazi could hear it from his house, over one kilometre away. Proceeding through the villages of Ganganagara and Simuliya, the crowd expanded to millions and extended for miles. While the devotees chanted and danced in ever-increasing heights of bliss, Kazi’s men ran away in fear of their lives. Chand Kazi also became overwhelmed seeing the massive procession heading his way. Lord Caitanya’s voice boomed in anger above the thunderous roar of the kirtana, “Where is that rascal Kazi? I have advented to propagate the congregational chanting of the holy names. If anyone so much as tries to cause obstruction, I will annihilate him. Yet even if the most lowly sinner takes part in this chanting, I shall remember him and save him.” Kazi, shaking in fear, quickly ran and hid himself inside his palace. "I wish to beg one favour in charity. You must pledge that the Sankirtana movement will not be checked, at least within the district of Nadia.” Chand Kazi replied, “To as many descendants that take birth in my dynasty in future, I give this grave admonition: no one should check the Harinam Sankirtana movement.” Hearing this, Gaurasundara and the devotees jumped up in joy chanting “Hari! 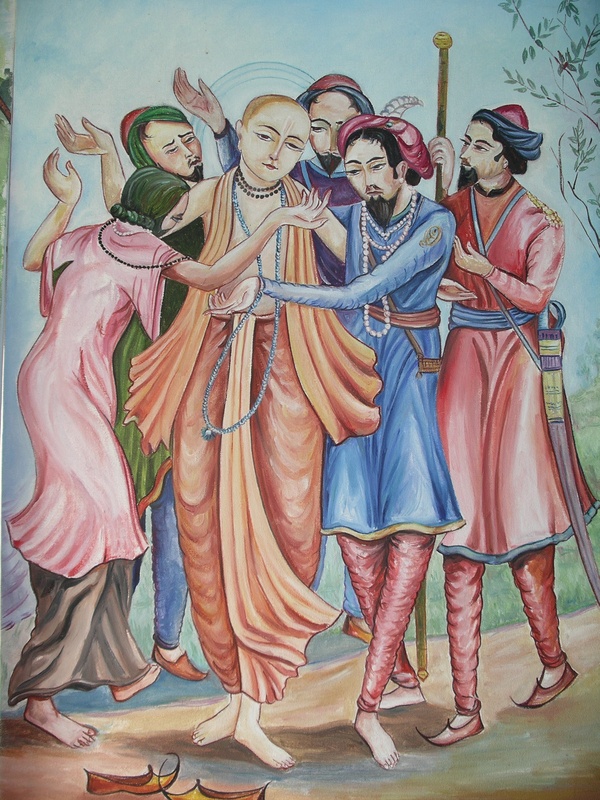 Hari!” and, with Kazi joining them, Caitanya Mahaprabhu led the Vaishnavas home in a victorious kirtana. Srila Vrindavana Das Thakura in Sri Caitanya Bhagavata states that only the most fortunate people hear the wonderful pastime of Mahaprabhu and Chand Kazi and about his deliverance. Crying, the Chand Kazi touched Caitanya Mahaprabhu’s lotus feet and prayed, "Only by Your mercy have my bad intentions vanished. May my devotion always be fixed on You."